Growing your business on the web and on mobile relies on the ability to communicate, integrate, and connect your products and services with different software programs. Application programming interfaces (APIs) are the key to doing this well—with the most flexibility, simplicity, safety, and control. An application programming interface (API) is a set of tools, definitions, and protocols for integrating application software and services. It’s the stuff that lets your products and services communicate with other products and services without having to constantly build new connectivity infrastructure. Creating new revenue channels or extending existing ones. Expanding the reach of your brand. Facilitating open innovation or improved efficiency through external development and collaboration. What about RESTful APIs, and SOAP? Simple Object Access Protocol (SOAP) and Representational State Transfer (REST) are two efforts that have helped make APIs simpler in their design and more useful in their implementation. As web APIs became more popular, SOAP was developed to help standardize message formats and requests—it is a protocol specification that makes it easier for apps in different environments or written in different languages to communicate. REST, on the other hand, is an architectural style. REST relies on 6 guiding principles that are ultimately simpler to follow than a prescribed protocol. For this reason, RESTful APIs are becoming more prevalent than SOAP. 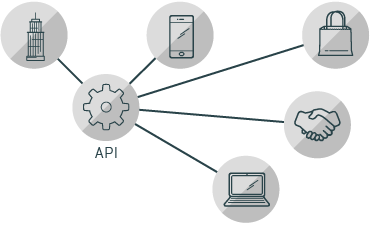 APIs are about integration—the connection of data, applications, and devices across your IT organization so that all of your technologies can better communicate and work together. You lose time and money when your technologies can’t talk to one another or anyone else’s. APIs, along with distributed integration and containers, are a key feature of agile integration. 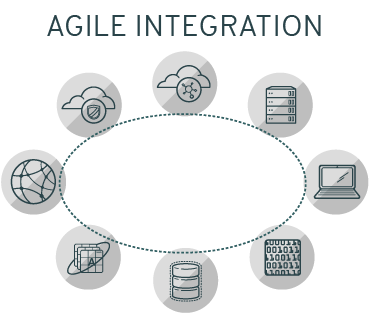 Agile integration is an architectural approach to your integration platform that emphasizes a small IT footprint; is highly scalable and available; and has well-defined, reusable, and well-managed endpoints. We believe the future of connected systems must do more than just support collaboration between teams and their technologies—it has to help encourage it. As technological change occurs more frequently, we believe that agile integration is the best way to help your business transform. Organizations are implementing strategies to manage their APIs so they can respond to rapid changes in customer demands. HTTP-based APIs have become the preferred method for synchronous interaction among microservices architectures. These APIs are the glue that connects all of the microservices together. Managing these APIs allows an organization to make sure the APIs are used in compliance with corporate policies and allows governance by appropriate levels of security, as some services may require different security policies than others. You probably don’t keep your savings under your mattress. Most people keep their money in a trusted environment (the bank) and use separate methods to authorize and authenticate payments. API security is similar. You need a trusted environment with policies for authentication and authorization. API security best practices include the use of tokens, encryption and signatures, quotas and throttling, and an API gateway. Most importantly, though, API security relies on good API management. APIs are the cornerstone of what is widely seen as the next iteration of business development. APIs are the wholesale version of a web presence, allowing others to access and integrate your data and resources into their public or private sites and applications. Hopefully by the time you have put an API management plan in place, you already have a healthy business model as well, which should provide a framework for your monetization goals. It’s not just about how you are going to generate revenue with your API, it is also about how you will keep your API in operation and performing for consumers. APIs are becoming the digital connective tissue of modern organizations, adding new capabilities to everything from their operations and products to their partnership strategies. It’s no longer a stretch to say that most organizations don’t ask whether to engage in API programs, but how to do so. Are you preparing to implement an API program at your organization? There are 3 questions to ask when you are preparing to design an API program. Red Hat provides modular, lightweight, and comprehensive API solutions that are open source, open standards, and available on-premise, in the cloud, or in hybrid environments. Good API implementation and management solutions should help you focus on your unique business goals. Our API solutions focus on reusability, IT agility, and a management interface that helps you measure, monitor, and scale, so it can grow as you do. As with all open source projects, Red Hat contributes code and improvements back to the upstream codebase, sharing advancements along the way. Of course, collaborating with a community is about more than developing code. Collaboration is about the freedom to ask questions and offer improvements—that’s the open source way and the power of the open organization. It’s why Red Hat has been a trusted provider of enterprise infrastructure for over 25 years. A distributed, cloud-native integration platform that connects APIs—on-premise, in the cloud, and anywhere in between. Make it easy to share, secure, distribute, control, and monetize your APIs for internal or external users.